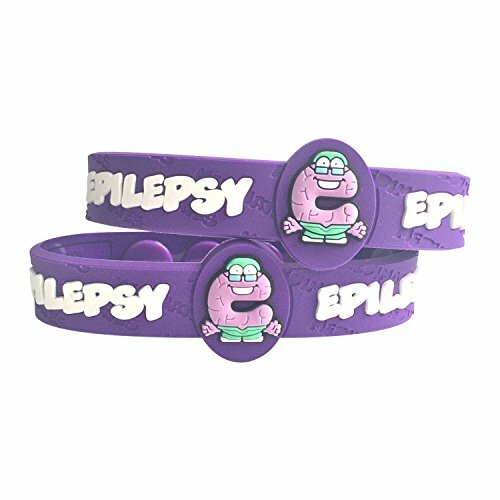 AllerMates Kids Medical Wristband - Epilepsy Children's Medic Alert Awareness Bracelet (2 Pack) by Allermates at Bijc. MPN: BR2-11629. Hurry! Limited time offer. Offer valid only while supplies last. -Our kid friendly version of a epiliepsy medical alert bracelet meets and exceeds U.S. and European safety standards for children's products. -Our kid friendly version of a epiliepsy medical alert bracelet meets and exceeds U.S. and European safety standards for children's products. -Designed with three, adjustable snaps, AllerMates medical alert bracelets will fit the wrist size of most kids ages 2+. -These medical alert bracelets are 100% latex free. Does your child have epilepsy? Remind caretakers of your child's health condition with one of these fun and fashionable medical alert bracelets for kids. Unlike other bracelets, the AllerMates medical alert bracelets for kids are designed with bright, cool colors so kids will love wearing them! Does your child have epilepsy? Remind caretakers of your child's health condition with one of these fun and fashionable medical alert bracelets for kids. Unlike other bracelets, the AllerMates medical alert bracelets for kids are designed with bright, cool colors so kids will love wearing them! Our kid friendly version of a epiliepsy medical alert bracelet meets and exceeds U.S. and European safety standards for children's products. If you have any questions about this product by Allermates, contact us by completing and submitting the form below. If you are looking for a specif part number, please include it with your message.